Shannon DeBlieck, a New York native now living in Alabama, said she owed about $4,000 in student loans when, many years ago, she and her husband consolidated their loans to get a lower interest rate. He owed $19,000. When they divorced four years ago, DeBlieck, 43, wanted to separate their loans — but discovered, to her dismay, that their joint debt, by then over $30,000, could not be split. Worse, she and her former husband shared legal responsibility for the loan, even though he had owed much more. She wound up having to pay all of it, she said, because he said he was out of work. As a result, after DeBlieck lost her home to foreclosure, declared bankruptcy, and was working as a waitress to support her three children, the loan servicer garnished her paycheck and put a lien on her tax return to pay the defaulted loan. DeBlieck said that although her former husband was ordered as part of a divorce decree to pay the remaining balance, that did not undo the contract she had signed promising to repay the loan, making her ultimately responsible. DeBlieck is among an unknown number of borrowers caught in a similar bind. Although the federal government 10 years ago stopped allowing joint consolidation loans, that change in policy did not provide any remedy for people who had already consolidated their loans between 1993 and 2005, such as DeBlieck. Compared with the student loan crisis as a whole, the problem is narrow in scope, and largely overlooked in the larger conversation about college debt. But for those who remain tethered to their former spouse’s debt for years, the situation can seem hopeless, borrowers and student loan specialists say. Boston lawyer Adam S. Minsky, who specializes in student loan debt, said he receives several calls a year from people seeking help with a joint consolidation loan, but tells them there’s little to be done. “It affects a subset of people, but for them it’s a huge problem,” Minsky said. The Department of Education says federal law does not allow the old loans to be split, even in cases involving domestic violence. Joint borrowers also cannot apply for income-based repayment plans unless both parties submit financial information, often an insurmountable hurdle for divorced couples. A department spokesman said an estimate on the number of joint consolidation loans that remain in repayment was not readily available, but specialists placed the number in the thousands. Even when divorced couples agree on a repayment plan, some people find themselves forced to assume the entire debt. Angela Lett, 41, of Jamaica Plain, said her former husband was very unhappy when their loan servicer, Navient, told them they couldn’t split their student loan after they divorced six years ago. He felt “saddled with my loans,” she recalled. Lett, who has two bachelor’s degrees and a master’s degree and works for a nonprofit, said most of the student loan debt was hers, and they agreed to deposit monthly payments into a shared account. She has been paying the entire debt herself and quipped that this year she went into “ninja payoff mode,” living frugally while knocking the loan from $70,000 to $47,000. 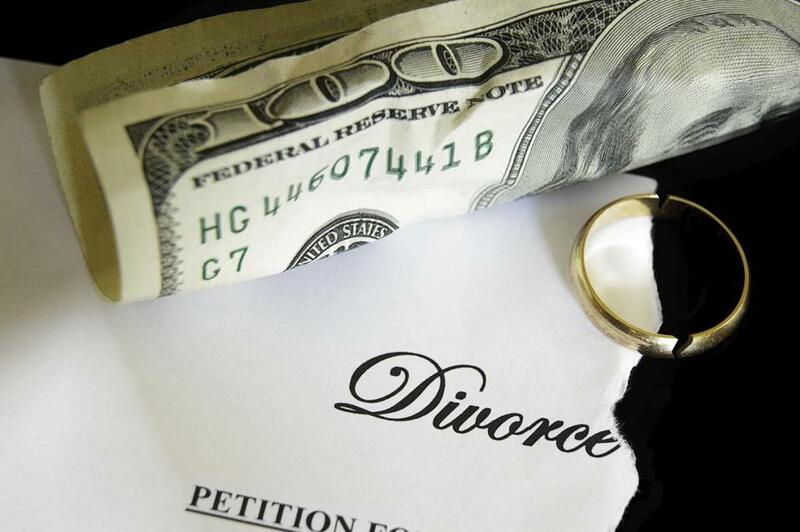 “It certainly would be one less piece of stress in my life if I could have separated my loans from my ex-husband as part of the divorce decree,” Lett said. Federal legislation to address the issue has been proposed, and petitions posted on Change.org have urged Congress to take action. But the problem persists, in part because it affects only a small constituency, specialists said. “It’s easy for lawmakers to see it as unimportant because it doesn’t affect a lot of people,” said Heather Jarvis, a North Carolina attorney who specializes in student loan law. The issue could be easily fixed, she said, with an amendment allowing the loans to be severed or reconsolidated. “I’ve never seen anyone put forth any justification why someone should be left holding the bag,” Jarvis said. Joshua Cohen, a New England lawyer who specializes in student loan debt, said he represents a woman who was a victim of domestic violence but can’t apply for an income-based repayment plan because she can’t obtain financial information from her abusive former husband. “We don’t want to deal with him,” Cohen said. Her situation underscores the need to allow divorced borrowers to apply for repayment plans on their own if they can demonstrate their former spouse could not be reached or refused to provide information, he said. Education officials have carved out some exceptions. When a spouse dies or becomes disabled, the portion that person initially owed may be discharged from the loan balance. But the larger problem remains. Mayotte speculated that Congress may be reluctant to change the law because separating joint loans would be complicated, requiring such calculations as how much each spouse paid toward the loans during the marriage. DeBlieck said she never considered any downside to a joint consolidation loan, or what might happen if she divorced. “We were going to be together forever,” she said. DeBlieck eventually made enough monthly payments to bring her loan out of default, and after her former husband provided financial information, she was put on an income-based plan that hasn’t required her to make payments the past two years. But as the interest piles up, she worries she’ll never be able to repay it. “I think it’s unfair that after a divorce he can completely, financially ruin me and there’s nothing I can do about it,” DeBlieck said.